For the 1940 film, see Somewhere in England (film). The cover of the 2004 reissue, which was originally rejected by Warner Bros. in 1980. Somewhere in England is the ninth studio album by English musician George Harrison, released in June 1981 by Dark Horse Records. The album was recorded as Harrison was becoming increasingly frustrated with the music industry. The album's making was a long one, during which conflicts with Warner Bros. Records arose. Somewhere in England was the first Harrison album to be released after the murder of his former Beatle bandmate John Lennon; the lyrics of its first single, "All Those Years Ago", pay tribute to Lennon. Harrison began recording Somewhere in England in March 1980 and continued sporadically, finally delivering the album to Warner Bros. Records, the distributor of his Dark Horse record label, in late September that year. However, the executives at Warner Bros. rejected the album, feeling it was "too laid back" and not sufficiently commercial. Harrison agreed to rework the album and to record new material. Harrison's original cover art, featuring his profile against a map of Great Britain, was also vetoed by Warner Bros. Returning to the project in November, Harrison was joined in his Friar Park studio in Henley-on-Thames by Ringo Starr, who arrived specifically to have Harrison produce some songs for him. They recorded two Harrison originals – "Wrack My Brain" and "All Those Years Ago" – plus a cover of "You Belong to Me" for Starr's album Can't Fight Lightning (later released as Stop and Smell the Roses). The two other songs were completed but "All Those Years Ago" was left unfinished. [clarification needed] Starr later admitted that the key was too high for him to sing. On 8 December 1980, John Lennon was shot dead outside his apartment building, the Dakota. After the shock and devastation of Lennon's murder, Harrison decided to utilise the unfinished recording of "All Those Years Ago". He changed the lyrics of the song to reflect the Lennon tragedy. With Starr's pre-recorded drum track in place, Harrison invited Paul and Linda McCartney, and their Wings bandmate Denny Laine, to record backing vocals in early 1981. Along with "All Those Years Ago", three more songs were added to the album: "Blood from a Clone" (a searing indictment of the WB executives who had rejected his original album), "Teardrops" and "That Which I Have Lost". To make room for the new songs, Harrison elected to drop four tracks from the original line-up: "Tears of the World", "Sat Singing", "Lay His Head" and "Flying Hour". A new cover was then shot in the Tate Gallery in London, and Somewhere in England was resubmitted and accepted. "All Those Years Ago" was released as the lead-off single in May 1981 to a strong response, reaching number 13 in the United Kingdom and number 2 in the United States. It was Harrison's biggest hit since "Give Me Love (Give Me Peace on Earth)" in 1973, and Somewhere in England benefited from the song's popularity. The album peaked at number 13 in the UK, giving the artist his highest-charting album there since 1973, and number 11 in the US. Somewhere in England's chart run was relatively brief in America, however, and it became Harrison's first album since the Beatles' break-up not to reach gold status there. The second single, "Teardrops", peaked at only number 102 on Billboard's singles listings. Reviewing the album favourably in 1981, People magazine called it one of Harrison's best and highlighted the "moving" tribute to Lennon. Robert Christgau was less receptive in The Village Voice, dismissing the songs as "sappy plaints". He applauded "All Those Years Ago" as Harrison's "catchiest tune in years", however, although he said that Lennon had yet to comment from the grave on the album sleeve's Krishna-esque message of eternal life. "Lay His Head" was first issued in October 1987 as the B-side of Harrison's "Got My Mind Set on You" single. The song was remixed for this release. All four songs omitted from the 1981 Somewhere in England were then included on the EPs accompanying the Genesis Publications books Songs by George Harrison and Songs by George Harrison 2. These two titles were available only in deluxe limited editions, published in 1988 and 1992, respectively. In 2004, Somewhere in England was remastered and reissued, both separately and as part of the box set The Dark Horse Years 1976–1992, on Dark Horse Records with new distribution by EMI. The reissue included the original mix of "Unconsciousness Rules" and, as a bonus track, Harrison's demo of "Save the World", recorded in early 1980. In addition, the rejected artwork was reinstated, replacing that used for the 1981 release. An alternative mix of "Tears of the World" from that submitted in 1980 was included as a bonus track on the Dark Horse Years reissue of Harrison's 1976 album Thirty Three & 1/3. The iTunes Music Store's digital version of Somewhere in England includes "Flying Hour" as a second bonus track. Rather than the rendition that Harrison had intended for release in 1980, it is the version that appeared on the Songs by George Harrison EP. With a running time of 4:35, this slower version begins with a studio count-in, is longer, lacks and adds guitar riffs, fades slightly at the end, and plays at the correct speed. In 2006, a survey was conducted on the GeorgeHarrison.com message boards to find the artist's 50 most popular songs. The results featured only one track from the album: "Life Itself", at number 29. The same survey included three of the four rejected songs: "Flying Hour", at number 14; "Lay His Head", number 27; and "Sat Singing", number 41. Paul McCartney, Linda McCartney, Denny Laine – backing vocals on "All Those Years Ago"
^ Madinger, Chip; Easter, Mark (2000). Eight Arms to Hold You: The Solo Beatles Compendium. Chesterfield, MO: 44.1 Productions. p. 459. ISBN 0-615-11724-4. ^ Badman, Keith (2001). The Beatles Diary Volume 2: After the Break-Up 1970–2001. London: Omnibus Press. p. 263. ISBN 978-0-7119-8307-6. ^ Graham Reid, "George Harrison (2011): Ten years after, a dark horse reconsidered" > "Somewhere in England", Elsewhere, 22 November 2011 (retrieved 14 August 2014). ^ Colin Larkin, The Encyclopedia of Popular Music (4th edn), Volume 4, Oxford University Press (New York, NY, 2006; ISBN 0-19-531373-9), p. 158. ^ Dave Thompson, "The Music of George Harrison: An album-by-album guide", Goldmine, 25 January 2002, pp. 18, 53. ^ John Harris, "Beware of Darkness", Mojo, November 2011, p. 83. ^ John Metzger, "George Harrison The Dark Horse Years (Part Three: Somewhere in England)", The Music Box, vol. 11 (5), May 2004 (retrieved 14 August 2014). ^ "George Harrison" > "Discographie de George Harrison" (in French), Music Story (archived version from 5 October 2015, retrieved 29 December 2016). ^ Thomas, Harry (6 August 1981). "George Harrison: Somewhere In England". Rolling Stone. p. 44. Archived from the original on 24 November 2007. Retrieved 19 November 2016. ^ Nigel Williamson, "All Things Must Pass: George Harrison's post-Beatles solo albums", Uncut, February 2002, p. 61. ^ a b Christgau, Robert (4 August 1981). "Consumer Guide". The Village Voice. Retrieved 29 October 2018. ^ DeRiso, Nick (5 June 2016). "How George Harrison Tried But Failed to Salvage 'Somewhere in England'". Ultimate Classic Rock. Retrieved 26 August 2018. ^ "Picks and Pans Review: Somewhere in England". People. 27 July 1981. Archived from the original on 27 December 2013. Retrieved 19 November 2016. ^ Simon Leng, While My Guitar Gently Weeps: The Music of George Harrison, Hal Leonard (Milwaukee, WI, 2006; ISBN 1-4234-0609-5), pp. 218–25. ^ "austriancharts.at George Harrison - Somewhere in England" (ASP). Hung Medien (in German). Retrieved 18 December 2013. ^ "RPM 50 Albums (July 4, 1981)" (PHP). Library and Archives Canada. Retrieved 28 August 2018. ^ "dutchcharts.nl George Harrison - Somewhere in England" (ASP). Hung Medien. MegaCharts. Retrieved 18 December 2013. ^ "charts.org.nz George Harrison - Somewhere in England" (ASP). Hung Medien. Recording Industry Association of New Zealand. Retrieved 18 December 2013. 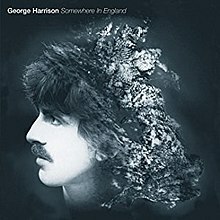 ^ "norwegiancharts.com George Harrison - Somewhere in England" (ASP). Retrieved 18 December 2013. ^ "swedishcharts.com George Harrison - Somewhere in England" (ASP) (in Swedish). Retrieved 18 December 2013. ^ "allmusic ((( Somewhere in England > Charts & Awards > Billboard Albums )))". allmusic.com. Retrieved 18 December 2013. ^ "Cash Box Top 200 Albums". Cash Box. 18 July 1981. p. 46. 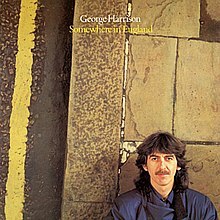 ^ "Album Search: George Harrison - Somewhere in England" (in German). Media Control. Retrieved 18 December 2013. ^ ジョージ・ハリスン-リリース-ORICON STYLE-ミュージック "Highest position and charting weeks of Somewhere in England by George Harrison" Check |url= value (help). oricon.co.jp. Oricon Style. Retrieved 3 October 2009. ^ "Top 100 Albums of 1981". Library and Archives Canada. Retrieved 28 August 2018. This page was last edited on 17 March 2019, at 20:35 (UTC).